A sophisticated selection of the most revered chocolate creations of James Beard award-winning chocolatier, Jacques Torres. 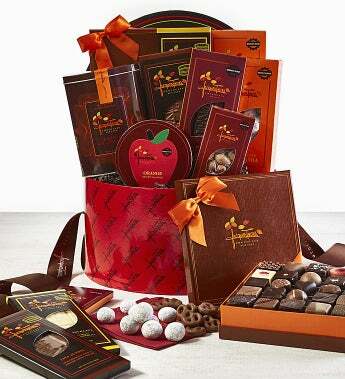 The Signature Collection is the perfect gift basket for any season, any holiday, and any person that is ready to taste what gourmet chocolate is all about. Gift Set includes: 25-Piece Bon Bon Assortment, Classic Hot Chocolate, Dark Chocolate Orange A-Peel, 10oz Milk Chocolate Macadamia Nuts, 4oz Dark Chocolate Almonds, Milk Chocolate Pretzels, and a variety of 3 Chocolate Bars. *We reserve the right to substitute any item of equal value, Container shape and color may vary. * Allergens: Prepared/packaged using machines that process dairy, soy, wheat/gluten, fish, eggs, nuts, tree nuts and peanuts. Contains nuts, peanuts, milk, soy. A variety of 3 Chocolate Bars. A sophisticated selection of the most revered chocolate creations of James Beard award-winning chocolatier, Jacques Torres. The Signature Collection is the perfect gift basket for any season, any holiday, and any person that is ready to taste what gourmet chocolate is all about. Gift Set includes: 25-Piece Bon Bon Assortment, Classic Hot Chocolate, Dark Chocolate Orange A-Peel, 10oz Milk Chocolate Macadamia Nuts, 4oz Dark Chocolate Almonds, Milk Chocolate Pretzels, and a variety of 3 Chocolate Bars. All presented in a beautiful signature hat box.